For the past year, a team of graduate students at the Lyndon B. Johnson School of Public Affairs at the University of Texas at Austin has been researching the nexus of U.S. national security and wildlife crime. We conducted extensive research and interviews with experts in wildlife conservation and security issues, including from the National Security Council, National Intelligence Council, State Department, and other government and non-governmental organizations. Similar to the conclusions of a 2014 National Intelligence Council report, we found that wildlife crime is a threat to U.S. interests abroad and that the United States has several reasons to care about this issue – including funding for rebel groups and potential terrorists. As discussed on our course blog, connecting an issue to national security, as the Obama administration has done with wildlife trafficking, is a potent means to get the attention of decision-makers. But since it is such a powerful frame, advocates have strong incentives to dramatize those connections, even if corroborating data may be hard to come by. For example, filmmaker Kathryn Bigelow’s highly evocative animated short film Last Days connects all sorts of bad actors to the ivory trade. It’s effective, but is it accurate? Wildlife crime has quickly become a source of funding for rebel groups, militias, and potential terrorist groups, that much is clear. But as Acting Assistant Secretary of State Judith Garber noted in a recent hearing on poaching and terrorism, the volume of funds is hard to pin down (precisely because the trade is illegal). Al Shabaab, a Somalia-based Islamist insurgent group that has made direct threats to U.S. soil and cross-border attacks in East Africa, has also been tied to the ivory trade. According to the Elephant Action League, Al Shabaab acts as a middleman in the trade and transit of elephant ivory from Africa to Asia and derives a significant amount of its funding from doing so. However, a joint UNEP-Interpol report found the extent of the organization’s funding from the ivory trade is likely overstated (the organization is far more reliant on revenue derived from the charcoal trade, they say). Other rebel groups and individual actors in Africa have also been involved in large-scale, organized massacres of animals. “Poachers on horseback from Chad and Sudan” slaughtered as many as 200 elephants in Cameroon in 2012. And armed groups in the eastern Democratic Republic of Congo derive some funding from wildlife trafficking, according to a UN report, albeit not nearly as much as from minerals and charcoal (in part because so much of the wildlife has already been killed). The actions of these groups undercut good governance in source, transit, and demand states, and much of their illicit activity occurs in already unstable countries, undercutting development efforts. See the protocol of the House Committee on Foreign Affairs hearing on poaching and terrorism from April 22, 2015. The scale of ivory and other wildlife goods being transported from source to demand countries makes the involvement of well-organized transnational criminal networks somewhat inevitable. But that same scale may make tracking easier. Several organizations, including the Center for Advanced Defense Studies (C4ADS) have been working to identify key transit routes and ports of exit and entry for wildlife trafficking across the globe. A number of major players have been identified, such as Vixay Keosavang, the leader of the Xaysavang Network in Laos that is notorious for trading in big cats, pangolins, and other illegal wildlife products. The U.S. State Department has put out a $1 million award for any information that will lead to his arrest, but according to the Environmental Investigation Agency, Vixay’s connections within the Laotian government protect him from arrest. Trafficking of wildlife products by these networks is of concern to the United States because they are using similar routes to those of drug, human, and gun traffickers, potentially reinforcing existing criminal networks. To crack down, the U.S. government has looked for opportunities to use domestic law where applicable. The U.S. Fish and Wildlife Service’s Operation Crash is an ongoing investigation to curtail rhino horn and ivory smuggling. Operation Crash began in 2012 and several arrests have been made within U.S. borders that support the connection between domestic wildlife sales and transnational organized crime. Michael Slattery, an Irish national and alleged member of the criminal organization known as the Rathkeale Rovers, was arrested in 2013 for selling rhino horns in New York for $50,000. The Rovers, who are described as “tight-knit extended family groups that live a nomadic lifestyle” by the Department of Justice, are alleged to regularly trade rhinoceros horns on the black market. In January 2013, Zhifei Li, a Chinese national and business owner, was arrested for purchasing a set of rhino horns in Miami, Florida. Li pled guilty to involvement in rhino horn and elephant ivory trafficking from the U.S. to China. Additionally, he served as the “boss” of a black market network that trafficked at least 30 rhino and elephant products amounting to more than $4.5 million. Corporations, money brokers, and other individuals in China were involved in wiring money to fund these activities. Occurrences like these highlight that while most trafficking is happening on routes from Africa to Asia, the U.S. government does have opportunities to make arrests within its jurisdiction. C4ADS’ research revealed that the flow of money from bank accounts is an important method for exposing who is involved. The United States has the capability of tracking these financial flows to identify key players and institutions involved in illegal transactions. A second option is to direct relevant agencies to create a periodic report on who is benefiting from wildlife trafficking. This option would involve cooperation between several U.S. and foreign law enforcement agencies to identify key groups involved in wildlife trafficking and create a comprehensive report on these groups. The report would entail, as much as possible, details of each group’s involvement in wildlife crime, how the money flows into and out of the group, and their threat level to U.S. and other interests abroad. A report of this nature could lead to the disruption of transnational networks and key financial sources for rebel groups in Africa, as well as increased awareness of wildlife trade’s connection to other dangerous organizations. With these two steps, the United States and international law enforcement agencies could start dismantling the most threatening networks. Further, they would continue elevating wildlife trafficking as a threat to global security and major contributor to criminal activity. One final issue bears mention. Many have pointed out the disparity in firepower between modern poachers, equipped with night vision goggle and precision weapons, and park rangers. With more than 1,000 park rangers killed in the last decade, there are ample calls for more arms and equipment to support the rangers, and “shoot to kill” policies have proliferated. On some level, as pointed out in testimony submitted to Congress by our group, this risks an arms race between poachers and those protecting parks. In some situations – we acknowledge sometimes better equipping rangers makes the most sense – we recommend another option: linking efforts to address wildlife crime to wider dispute settlement and disarmament efforts. This highlights one of the prime fears of those concerned with securitization: that military solutions begin to take precedent. 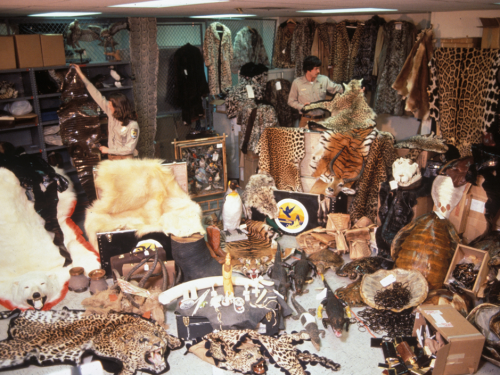 Our group feels there is ample evidence that wildlife trafficking presents a national security threat to the United States, particularly its overseas interests. But we also recognize that this is a threat that cannot be mitigated by force alone. “Without a substantial reduction in the demand for ivory and rhino horn, efforts to deter poachers through armed interventions may disrupt poaching, but not stop it,” concluded a 2015 report from the research group Small Arms Survey. We agree (see companion research on demand). Stopping the current poaching crisis requires a multi-dimensional approach to disrupt supply, dampen demand, and create new incentives for communities to protect wildlife. Cameron Lagrone is a second-year Master of Public Affairs student at the Lyndon B. Johnson School of Public Affairs at the University of Texas, Austin. Josh Busby is an associate professor at the Lyndon B. Johnson School of Public Affairs at the University of Texas, Austin. He directed the year-long graduate course on global wildlife conservation.